Embellishing has become a national pastime for people of all ages! From a simple applique to a dazzling design that thrills the eyes, you can certainly say that when it comes to embellishment – anything goes! T-shirts and sweatshirts are the primary objects of embellishment although certainly not the only possibilities. You can use the jewels, sequins, buttons and other trims on purses, shoes, belts, jeans and shorts, hair bands and bracelets, just for starters. 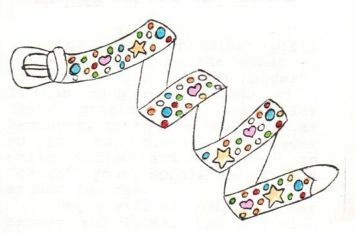 To get you started, try the razzle dazzle studded belt, or go for the trimmed sneakers. Your friends will probably want you to make them a pair too! Make this lavishly studded belt in one evening, have a great deal of fun doing it and make a fashion statement in the morning. Friends will rave about this ornamental belt and they won’t believe that you didn’t spend lots of money on it, much less that you made it yourself! Start with a cloth or leather belt in the desired color (TIP: you may already have one in your closet that will work). Adorn it with an assortment of gold and silvertone rivets, multi-shape Western motifs and colorful crystals. There are many shapes, styles and colors to choose from on the market these days that won’t put a large dent in your pocketbook. Remember to follow the manufacturer’s instructions for attaching your trinkets or try using a small hammer to push the rivets through and finish turning the points under on the other side. Just follow your instincts on placement and you’re sure to have a gorgeous finished belt! Use bright add-ons like these to give your sneakers pizzazz! For kids age 5 to 95! Buy precut vinyl shapes (hearts, lips, lightning bolts, circles, arrows, etc), small bows and beads at your local craft store. Give all of these items to your kids and show them how to use glue to attach them to a plain pair of canvas sneakers. Add beads to the shoe laces for a finishing touch. Children will have loads of fun assembling them and they’ll have happy feet when they’re done! 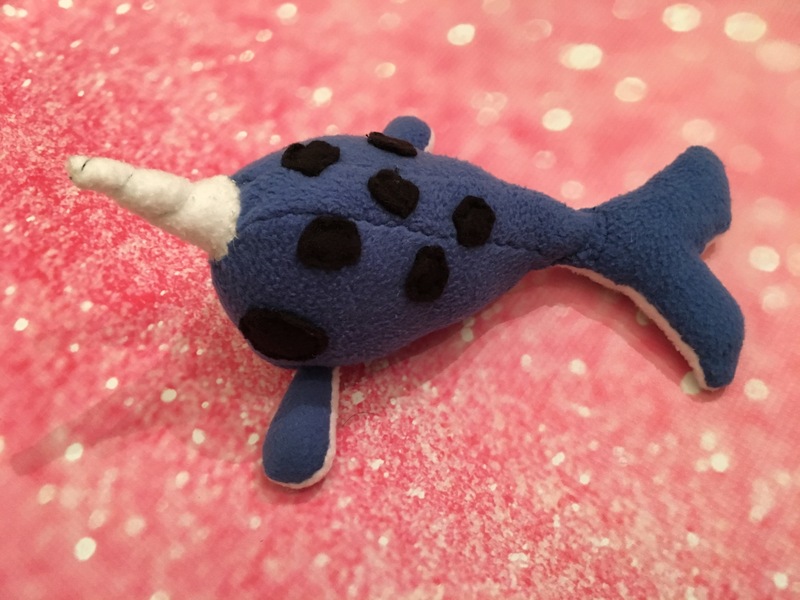 What do you think about the newest addition to our family of pattern designers and her Narwhal Fleece Stuffed Toy Pattern? Many times during the sewing / crafting process we seem to have our heads in the clouds as we fast forward through the current project. Of course, most of us have been sewing or crafting for so long, we can just about do anything with our eyes shut. Right? Actually that’s where most of the problems begin — we no longer “think about” the minor things that can cause big sewing problems. I’m going to outline just a few of the things that we take for granted, yet sometimes neglect to do. ** Always turn the hand wheel of your sewing machine toward you, never turn it away from you once the machine has been threaded. Also never run a threaded sewing machine unless there is a piece of fabric under the presser foot; this is probably the easiest way to jam the machine, break needles and throw the machine out of timing! To eliminate the possibility of a child doing damage to your machine, always unplug it after finishing for the day. ** When beginning or ending a seam, make sure the take-up lever is in its highest position. ** Be sure that the needle is in the center position when straight stitching. Never straight stitch with the needle in the left or right positions (an exception to this is when using a zipper foot). ** In some types of fabric, such as chiffon, you may find the needle will drag the fabric down into the needle hole when you begin to sew. Make sure you are using a fine needle, have the tensions set properly, and if the problem still exists, place a piece of gummed tape over the needle hole in the throat plate of the machine. The tape will prevent the fabric from being “pulled” down, and can be removed easily later. ** Back-stitching at the end of a line of machine stitching firmly fastens the end, but sometimes can cause puckering of the fabric. To prevent this, hold the fabric taut as you continue to operate the machine, taking several stitches in the same spot in the fabric. These several stitches will secure the thread, but use your own judgement in using this method, as you could cause damage to very fine lightweight fabrics. ** To protect your sewing machine while it is not in use, you should place a piece of fabric under the presser foot and lower the foot onto it. Also, be sure to cover the machine, as any dust settling in and around the moving parts can cause sewing problems later on. ** Never oil your sewing machine without first cleaning it as well as you can, removing all the dust, lint, and pieces of thread from the bobbin area and throat plate area. ** There are three main points to be aware of each time the sewing machine is used: 1) Make sure the take-up lever is at its highest point when stitchine is started and when the work is being removed from the machine. 2) Always drop the presser foot before changing the tension on the upper thread (if the presser foot is in the up position, you can turn the dial all day long, and the tension won’t change!) 3) When winding the bobbin, always thread the lose end of the thread through the hole in the side of the bobbin. If this loose thread end is held firmly, it will break off, leaving a smoothly wound supply of thread in your bobbin. While most of these tips are no-brainers, it only takes a few minutes of carelessness to jam a machine, break a needle, and in the end cause a perfectly easy project to go haywire! These hints are an excerpt from Sewing Machine Repair For The Home Sewer. For complete information and instructions on keeping your sewing machine in tip top condition and out of the repair shop, you can check out the information at SewMachineRepair.com. 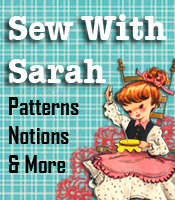 If you’re one that prefers the instant information via downloadable book, check it out at SewWithSarah.com. 500 Kwik & Easy Sewing Tips – sew faster, better and easier! If you’re like me – can’t pass up super sales on fabric – and over time have drawers, boxes, bags and shelves full of all types of fabrics – there comes a time when all this stash needs to be organized! Not long ago I did just that – organized my stash! 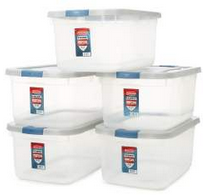 I started out by getting some clear plastic bins, like the ones pictured, then very methodically did the organizing. After separating the long lengths, I divided them by colors — greens in one container, blues in one container, reds/pinks in one container, and so on. This makes it very easy to get to the correct color for your next project. 2. All fat quarters in one bin. Fat quarters are usually a variety of colors/shades, and in most cases the items I make from them are very colorful and I don’t stick to just one color or shade. 3. All scraps and less than a yard in one bin. This is a big one for me, as I use tons of scraps for small projects. This is also my go-to bin when my grandchildren are wanting to be creative and need some pieces of fabric! This is also a big deal for us – never “throw away” a worn or outgrown pair of jeans! We love making aprons from jeans, gym bags, jeans purses, and tons of other items. 5. Don’t throw away “used” zippers, buttons and trims. This requires a smaller box, but if you’re throwing away torn clothing garments, ALWAYS take off the buttons, hooks and eyes, zippers and other trims that can be reused. Keep these items together in a box. There have been many times that I’ve found just the right buttons for something I was making, and of course when my grandchildren need buttons for eyes on that little animal they’re making, or lace to decorate a small pillow, we always head for this box. Once you get your stash organized, you’ll be ready for whatever project is next in line!